GSMArena team, 25 October 2011. The Nokia Lumia 710 is the more affordable WP Mango option that the Finns are going to be offering, but it's certainly not looking like a cheap device. 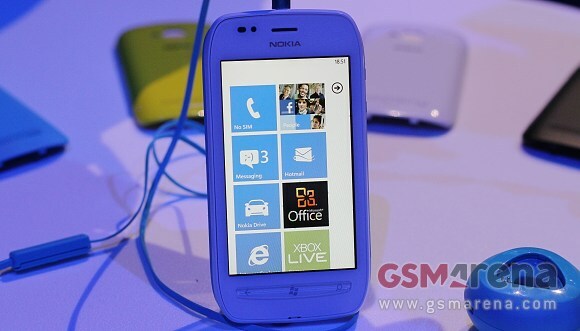 And its specs sheet isn't that far away from that of the Nokia Lumia 800, either. Sure the deep-blacks of the AMOLED are gone, to be replaced by an LCD and the camera resolution has been taken down a notch, but the screen size and resolution remain the same and there's the exact same amount of processing power under the hood. Plus the LCD isn't half bad at all, so the Lumia 710 might even end up as the better options in terms of value for money. Design-wise the Nokia Lumia 710 will be much better appreciated by the younger audience. It may lack the sophistication of its 800 sibling but it has charisma and you shouldn't underestimate the easy customization options, provided by the replaceable battery cover. What's really cool is that Nokia Lumia 710 got the exact same software treatment as its more expensive sibling. You get the same nicely performing Windows Phone Mango platform, topped with the Nokia-exclusive voice-guided navigation. And here comes the Nokia Lumia 710 hands-on video. Check out the benchmark results of the two Lumia phones on the following page.